You are currently browsing danacassell’s articles. The news has made much ado about the “phenomenon” of “clergy burnout” recently. Sparked by this article in the New York Times on August 1, the commentary has come hard and fast. Proposed reasons for this burnout have been numerous and wide-ranging: churches are too demanding ; pastors don’t spend enough time on their own spiritual health; the financial realities of seminary debt and shrinking pastoral salaries just aren’t sustainable. I don’t disagree with any of those proposals – yes, churches demand a huge workload from their ministers; yes, pastors are often woefully overscheduled and spiritually undernourished; and yes (“YES!” – my bank account echoes in capital letters), seminary is expensive and salaries in ministry are low. But I think all this commentary is entering into a problem much larger and more complex than the NYTimes makes it out to be. Clergy burnout is actually a symptom of a disease of the church at large. Think about it – if this were happening in any other institution, we wouldn’t be proposing such small solutions. We wouldn’t tell overworked bank presidents that their stock holders were simply asking too much of them. We wouldn’t tell the newly elected city council member following a dozen recently burnt out officials before her that what she really needs to do is to pay attention to her own philosophical and political integrity. And while we might think about adjusting the price of graduate school to be more in line with tenured professor’s salaries, we wouldn’t cite that as the sole (or, at least, ultimate) reason a university was unable to keep a full faculty. Something else is going on. A friend helpfully pointed out that the commentary on clergy burnout is slowly turning toward a capitalist critique – that we treat pastors as a commodity following the rule of supply and demand, and expect them to act as such. I think he’s right. We’re burning out our leaders because we’ve forgotten what it is we’re about, and therefore what it is we need them to be about. Pastors aren’t commodities; they are people. They are sisters and brothers who walk with us toward faith. We too often want them to do all the work of faith FOR us, instead of ALONGSIDE us. Jordan wrote last week about the theology of substitutionary atonement; but I think we’re in more danger from our practices of substitutionary discipleship. If we want healthy pastors, we need healthy churches. If we want healthy churches, we need healthy relationships. And if we want healthy relationships, we need healthy understandings of what it is to be a part of the body of Christ – each of us taking up our share of the work of being about the work of the Kingdom. For today’s young adults (and probably the generation of young adults before this one), metaphors of faith live and breathe in images of motion: journey, quest, voyage, exotic adventure. Think about it for a minute: how many Safari Adventure vacation bible schools did we attend during childhood summers? How many times have we sung the song Guide My Feet (…while I run this race)? How many youth group discussions did we participate in about how to bring the mountaintop experience of NYC or workcamp (places we traveled long and far to get to) back home? Yes, we’re on a journey, he reminds us, but not all movement is progress. What if we stood still for a while? What if, instead of falling into the caravan of wandering Israelites, we planted ourselves with the Psalmist’s tree by streams of water and let God teach us how to bear fruit in one place? What would happen – to us individually and to us as the Church of the Brethren? What do you think? Is faith about roots or wings? African safaris or neighborhood block parties? The Annual Conference Special Response Resource Committee has just posted their study resources for conversations about sexuality in the church. They close their curriculum (a series of 8 sessions of biblical study and conversation on the two Annual Conference queries from 2009) with the encouragement to “continue to seek out respectful dialogue with others throughout our denomination.” This space has become a place for conversation and respectful dialogue on many other questions facing the church, and I’m curious if we can take advantage of it to share and seek the Spirit amongst ourselves on these questions. …to respect the dignity and intrinsic worth of each participant. …to honor moments of tension between us as opportunities for the Spirit to teach and lead. …to be open to the varied insights emerging from our shared study of scripture. …to be honest about my own doubts and fears. …to listen carefully, speak gently, and prayerfully consider perspectives that are different from my own. …to begin from a place of trust that God will be present with us in this process. With those commitments in mind, what do you make of the study resources? Will you use them in your congregation? Will you study them yourself? Have you done any discernment of this sort before? Where is the Spirit leading us? 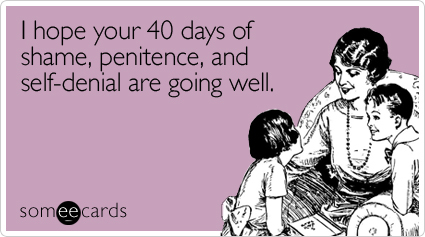 I get the cynicism, but I am a fan of Lent. Honestly, it’s my favorite liturgical season (and yes, I realize that having a favorite liturgical season makes me fatally nerdy). Lent seems to create an atmosphere of anticipation – as if, were we able to dive deeply enough and honestly enough into the pathos of the journey to the cross, then we might just be able to experience the unspeakable joy of the resurrection. Brethren have long embraced the idea of living on less. We practice simplicity – I think – because it keeps us mindful of “the life that is really life.” In that light, a Lenten fast might be a very Brethren thing to do. Are you keeping a fast this year? Is it growing your soul? At the Church of the Brethren staff retreat last week, former Bethany Seminary president Gene Roop led an awesome biblical study of texts on “Radical, Compassionate Discipleship.” I forgot how fun it is to have texts broken open like that, and to read them in community! We studied a couple of narratives, and then turned to the poetry of Isaiah 55. It was, for many in the room, a rough transition. Poetry is harder to get into, harder to understand, and besides, we were attempting it right after lunch, during prime nap time. I love that. It says to me (much like the content of Isaiah 55 – check it out) that God’s plan for the world and for the church is not always linear, does not always make immediate sense, and takes a little extra effort to get into. It reminds me that God works in ways that are not always what I would prefer, but in ways that – once broken open a little – make such a beautiful and unending pattern that its grace is almost incomprehensible. It reminded me, again, that I participate in the life of the church not because I am duty-bound to do it, but because I continue to believe and expect that God is doing beautiful and transformative things through Her poetic presence in the world, and that I get to be a part of that. What reminders of poetic discipleship have you encountered recently? In her new book, Lit (which I highly recommend), Mary Karr details her path to sobriety and faith. She stumbles into God, prayer, and the Catholic church at the insistence of both her sponsors and her 8 year old son. The practices that finally embrace her are the Ignatian Spiritual Exercises – including the Examen (for a low-key Protestant introduction to this, check out Sleeping with Bread). I love the Examen, and when I share it with young adult volunteers, they latch onto it immediately. But I’ve been working on a project with a couple of young Catholic women, and at the very mention of Ignatius or the Examen, they let out immediate groans of boredom. Raised in Jesuit practice and attending Jesuit colleges, they’ve been Examen’ed out. For them, spiritual practice is old news, but for me and for a lot of young Brethren, it’s not something that I learned much about in Sunday school. So, my question for y’all is: What spiritual practices have you found and incorporated in your life? How do Brethren pray? The concept of traditioned innovation holds that entrepreneurial advance in the church for a new day is never a start from scratch. We need always to be innovating boldly — and truth be told the church is entirely too reticent to change too much of the time. But when we change we don’t do so just for change’s sake, or to attract more people, or from scratch. Instead, we always reach back into the depths of Christian tradition to recover something we’d neglected there and reframe it for a new day. As a part of the radical reformation, our tradition is steeped in “traditioned innovation.” We’ve always been “reaching back into the depths of tradition to recover and reframe,” whether it was reviving the practices of adult baptism and footwashing, or insisting on reading scripture together in community – like the first believers must have done with Paul’s letters or Mark’s gospel. But I’m curious: what things ought we to recover and reframe right now? Whether they’re things from our Brethren history or things more ancient, what are the aspects of Christianity that you wish we did more of, or better? Which traditions are you recovering, now? What innovations are taking place in your communities? So, what defines Brethren community for you? What are the practices that we participate in together that form us into Christ’s body? And, how are they different from any other group of people – civic or Christian? Thanks to Steve and Kate, we have our official “Minute” from our time together. Check it out. Discuss. As young adults, we are comfortable living in metaxis, the state of belonging completely and simultaneously to two different autonomous worlds. For that reason, we are relatively accustomed to living within the tensions that exist between the church and the larger culture. We feel comfortable acknowledging different views of church leadership and organization and recognizing the disparity between the current state of the denomination and our hopes for the future. In many ways this flexibility can be advantageous. We see that ambiguity can be a gift. However, we also recognize that we may have become so accustomed to living within these tensions that we often do not seek or are not effective at finding resolution. We are searching for a balance between accepting brokenness and seeking wholeness. We find that many of the current polity structures and practices of the Church of the Brethren are still quite meaningful and relevant, but we yearn for new ways of doing church business. For example, we trust the validity of Annual Conference, but we seek a more effective process that does not create dissenting minorities and adversarial relationships. We believe that in church business, as well as in other areas of our lives, process and conversation are as important as the outcomes and products we achieve. Therefore, we offer the models of World Café, discernment circles, sidebar conversations, and mentorship as resources to facilitate our communication and business processes. Furthermore, we firmly believe that strong mentoring relationships with experienced leaders are needed to foster such communication and processes. We understand that many of us are frustrated with the current state of leadership and/or organization within the church, but we find hope, light, and energy in the midst of that frustration. We recognize that the Body of Christ is in constant incarnational transformation. We hope for the transformation from “church” into a community of disciples and disciple-makers. We long for the church to be “Brethren” at its best, based in scripture, spiritual discernment, and social engagement. We acknowledge that even within this small group of young adults, there are many different ways of viewing scripture, spiritual discernment, and social engagement, but we are committed to seeking the mind of Christ together. As a postscript, we recognize that many groups were not fully represented in this process and that this “minute” is not a fully authoritarian document or even a descriptive or prescriptive statement. We simply offer this report as a snapshot of some of the conversations that took place in this specific time and space. So. What do you think? We’ve had a month to reflect or recover from some pretty intense conversations. How have they steeped or percolated or faded away? What are you still carrying from our time together in Arizona? Man, is it good to hear the things I’m constantly thinking about Church come out of other people’s mouths. My own thoughts – both frustration and celebration – were echoed and confirmed over and over again in our discussions. It’s good to know I’m not alone. Something is moving and shifting in the Church of the Brethren. God is doing a new thing with us, and while I can’t quite see where it leads, I’m happy to get on board with what seem to be transformational ways of being together in new (or old) ways – less business and more fellowship, less formal structure and more incorporation of spontaneity. I’m still a little lost about what it means to be a leader among such a shifting and scattered people. It was good to be together, but where do we go from here? And, more specifically, I wish we’d gone into a bit more detail about the specifics for a Church of the Brethren minister – what ought to be required and expected and provided of and for them?